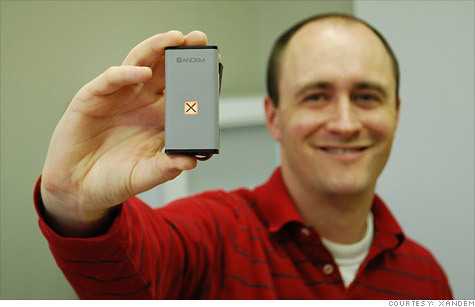 Xandem founder Joey Wilson shows off the company's motion-detecting sensor nodes. (CNNMoney) -- Imagine a real-life version of Harry Potter's magical Marauder's Map, which showed the location of everyone prowling throughout Hogwarts castle. That's what startup Xandem is building: a new kind of all-seeing motion-detection system that's poised to shake up the security market. There are many different ways to track motion, but most commercial systems rely on optical beams that require uninterrupted sight lines. Heat-sensing infrared systems don't have that weakness, but they're prone to false alarms and can be blocked by anything that insulates body heat. Xandem's secret sauce is its use of radio waves, which can go through things like trees and walls. That means motion sensors using those waves can be completely hidden -- a breakthrough that's drawing notice from both scientists and security industry professionals. The Salt Lake City-based company was hatched four years ago at the University of Utah, when electrical engineering doctoral student Joey Wilson spied some cutting-edge radio wave research from his advisor, Neal Patwari. Wilson, who has a background in wireless communications and signal processing, offered to team up with Patwari. "I thought, 'If I don't jump on this now, I'm going to miss a great opportunity,'" Wilson recalls. The pair envisioned a system that would make it possible to see through walls and detect people wherever they were in a building. Within a few months, they had a working prototype of a node, which works in tandem with other nodes to create a field of radio waves. Disturbing those waves triggers the sensors' detectors. Wilson and Patwari won the University of Utah's 2010 business plan competition, then raised $110,000 from friends and family to start Xandem. They also picked up a Utah Innovation Award and a $40,000 grant from a state technology development fund. But by last fall, Wilson and Patwari were largely out of money -- until Ryan Smith, an angel investor in Salt Lake City, swooped in with a $250,000 investment in the company. A few weeks later, the company, which now has a staff of six, scored a $150,000 SBIR grant from the National Science Foundation. Xandem's first product, which went on sale in April 2011 to early test customers, is a wireless motion detection system employing 1x 3-inch rectangular nodes that resemble iPod Nanos, only thicker. The tiny nodes, which run off battery power or wall outlets, can be completely hidden; would-be criminals can't disable what they can't find. A mass-market version of the system is slated for release this summer, with prices ranging from $600-$2,200, depending on the size of the deployment. "Our target is the commercial security market -- and that's worth billions," says Wilson. But being able to see where people are located in a building will be valuable to other markets too, like firefighters, police, border agents and SWAT teams. The Brahma Group, a construction firm in Salt Lake City, recently began using the Xandem system to protect one of its equipment storage warehouses, after two pricey orbital welders were stolen 18 months ago. The Xandem system, linked to the warehouse's alarm system, is well hidden, with some of the nodes embedded in objects like steel beams or located behind pieces of equipment. "As long as the movement is within the network of nodes, it'll pick it up. It's not dependent on a direct line of sight," says Tony Archibald, Brahma's operations manager. "We're considering deploying it in our other warehouses too." Carey Rappaport, associate director of the Bernard M. Gordon Center for Subsurface Sensing and Imaging Systems and a professor of electrical and computer engineering at Northeastern University, sees Xandem's line-of-sight flexibility as one of its key advantages. "You can plug a node into an outlet behind your couch and still know if someone comes into the room," he says. Xandem's systems are also starting to pop up in high-end homes, like the oceanfront penthouse entrepreneur Philip Charles Gamett is having designed in Dubai. There, it's being used for ambiance, not security: Plugged into a home automation system, the sensors can trigger responses to cues. "It could be the music, lighting, air conditioning, even how the blinds are adjusted," says Nathan Williams of Redwood Technical Services, the firm that is handling the installation. "Our client wanted to be able to detect if someone was in a room, but without having that person do anything, like press a button. Xandem was the only system I could find that was completely invisible."